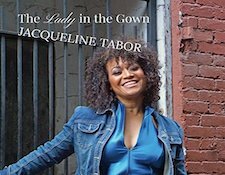 Anyone living in or traveling through the Pacific Northwest may have had the opportunity to hear Bellevue, WA native Jacqueline Tabor perform live, which she does quite regularly. Educated in both Washington State and Baton Rouge, LA, Tabor has a grasp on multiple genres of music, from jazz, to blues, to Americana to traditional ballads. On her latest release, "The Lady In The Gown," she showcases them all with a voice that is very sweet and pervasively easy to listen to. She is backed up by a piano, guitar and an acoustic bass played with surprising authority by Greg Feingold. Despite being accompanied by only three instruments, the range and authority of Tabor's voice makes this release both simple and at times, complex. All in all, a first-rate work by a singer with a superlative voice. Sometimes I just don't know what I like. I like traditional jazz at times and other times, not so much. I'm also given to a big band sound if it is done in a certain way. 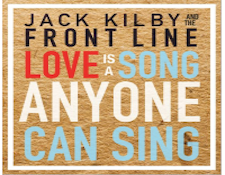 What Jack Kilby has managed to accomplish is release a work that caught my attention from the first note on track one and held it throughout all twenty-one songs. Hailing from and performing around the Northern Virginia / greater DC area, Kilby and his "ensemble" of musicians deliver a hard pounding at times, melodic at times and at all times wonderful collection of a well-orchestrated work of jazz and big band music. Of the fourteen musicians and vocalists on "Love," seven of them are playing woodwind instruments. What you have is a work with sax, trumpet, French Horns and flute moving in and out with surprising ease thus keeping the presentation interesting. Perhaps the best thing about this release is that if I don't have a real penchant for either traditional jazz or big band separately, I can still listen to this one. It does it all. 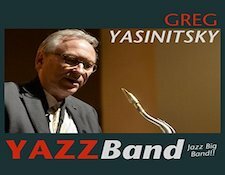 Greg Yasinitsky (YAZZ) is one of the more accomplished jazz musicians I have ever come across. He is a forty-year musical educator and currently Regent Professor of Jazz Composition and Saxophone at Washington State University. He has played alongside such greats as Ella Fitzgerald, Sara Vaughn, Ray Charles, Randy Brecker, Lou Rawls and Kirk Whalum to name a few. He has received the American Prize for Jazz Concerto for Piano and Orchestra. His accomplishments, frankly, are more than space allows. None of this is worth salt if the music isn't really likable. So let me make it really simple - YAZZ is a fantastic musician. I thought his compositions for Jazz and Big Band music were arranged in such a way that the wide variety of musicians could meld in and out of the individual measures of each song. Some tracks are hard charging and upbeat, something I really like, and several were more subdued and instead slow and melodic. Regardless of the pace, each song was expertly crafted by one who not only knows how to do so, but by one who also teaches others how to do so. If you like big band and horn driven jazz mixed up together, check out the YAZZ Band. You won't go wrong. Born in Baton Rouge, LA of Taiwanese descent, Peter Lin has a rich heritage in the style of music that has popularized the lower parts of Louisiana for generations. 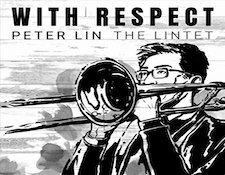 While I am not normally given to a slide trombone as the lead instrument, Lin did manage to entice me to listen to each track on the CD. Partly because of his smooth delivery, partly because of the arrangements and mostly because I just liked what I heard kept me interested. Lin had his tutelage under trombone master Slide Hampton and was obviously a superlative pupil. As much as this is a work resplendent of jazz and blues, it also has music native to Taiwan mixed in for good measure. Currently, Lin is on the faculty at Jazz House Kids in Montclair, NJ and regularly performs live in the greater New Jersey area. Anyone who read through the title above may have guessed this work is an homage to music by the great Stevie Wonder. If that is your thinking, you are exactly correct. All ten tracks are covers of some of Stevie Wonder's greatest hits. Originally starting out in Gospel music, Austin quickly discovered he had a real love for soul music. He studied piano and organ under the renowned jazz educator Barry Harris. 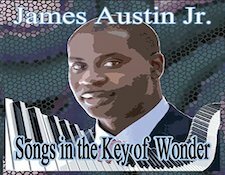 From there, Austin has performed in Carnegie Hall and was a semifinalist in the prestigious Thelonious Monk International Jazz Piano Competition. What he delivers in this compilation of Stevie Wonder songs is a fresh look through crafty arrangements of traditionally soul music done in a jazz / soul style. From an instrument standpoint, all of the pieces of the dual genre puzzle are there - sax, guitar, bass, percussion, trumpet, and drums. What Austin has managed to accomplish is to take music heard many times before and make it fresh and innovative. And he did a great job as well. I found myself singing along because I knew the words but felt as if I was hearing each song for the first time. When it comes to jazz woodwind instruments, I greatly prefer the saxophone to the trumpet. That does not mean, however, I don't like trumpet centric jazz compositions done right. 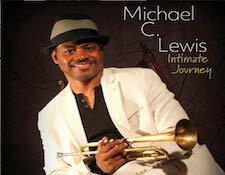 And yes, "Intimate Journey" is a work done right. Lewis is originally from Houston, TX but now resides in New York city. He has performed at venues such as the Apollo Theater, The Blue Note and the Village Vanguard as well as other notable NYC musical and jazz landmarks. And while I would call this primarily a work of jazz, it would be impossible to not recognize Lewis' interest in R&B and Funk. Because that is what "Journey manifestly is, a pounding, thriving, conglomeration of jazz, funk and R&B. And I loved it. I loved it despite not really being inclined to the trumpet as the lead instrument. One reason why is how Lewis manages to blend such diverse musical styles into each song. I had a hard time deciding if he as a jazz musician with a flair for funk, or a funk musician in the best 1970's Philadelphia style who suddenly grew a fondness for jazz. Either way is not important. This is, stylistically, a work that kept me interested in what was next through all eleven tracks. And as much as I love jazz, what I really loved first was great funk / soul/ R&B, Earth, Wind & Fire, Parliament, Temptations style of music. Jazz came later. Because this one has both, woven together like a fine piece of cloth, I couldn't help but love it. Which I do - and certainly will again.